Nice hostel, little bit outside of the town itself, but thats fine because the hostel is directly on the beach and you have some kind of private beach in front of you all the time. Nice staff and nice people, so really nice vibe. Also they have a horse and two donkeys as "pets" walking around. If you plan do stay in montanita, stay here. A lot of people come to this place as guests during the day and evening because its so nice. This Hostel has everything you need. Whether you just wanna hang out at the pool, go for a surf or play a game of pool. It's location a little bit outside of town is a huge plus too as you're not always surrounded by noisy Montanita but if you wanna go out it's still close enough to do so. But what makes the most is the vibe and the people. I was supposed to stay 4 nights but ended up being here for 3 weeks just because of all the folks here. A huge THANK YOU to the Kamala Family for everything! Loved my stay. It’s very social and the location is super beautiful. If you want to party you can but I was just there to hang out and chill. Since it’s not right in the city it’s an amazing place to do just that. The owner and volunteers are all very nice and the animals are adorable (one donkey is slightly annoying tho-watch your stuff!) Wish I could’ve stayed longer! The location was great right at the beach. The staff was amazing always helpful and ready to party. Really good hostel for someone who is traveling alone I didn't have any struggles meeting people. At dinnertime everyone comes together and enjoys the good food from the hostel. 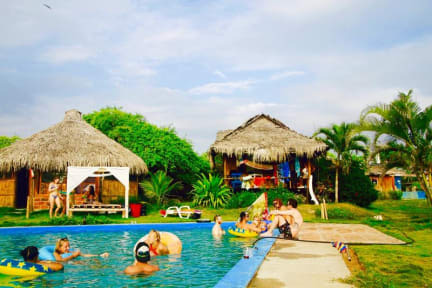 Kamala Hostel is an ideal place to stay in Montañita. It's close to the center but its surrounding areas are quite calm. So if you want, you can get a good night's sleep. However, the hostel has a lot to offer if you want to do more than relax. The toilets are rather small but very clean. Over all, it's a good place to meet new people, relax, surf, and have a good time. Such a Great Hostel to chill and Relax! Beautiful Place, Nice People. Perfect to take some Time off But with Connection to the partycenter. Clean Room, amazing Pool, lovely animals. Food is Great, But quite expansive, if You always choose to eat in the Hostel. Best wifi i had so far btw. Definitly a Party Hostel with a spring break vibe if you like that its a great place, but it's hard to catch some sleep at night when you are not drunk. They also wanted 1 Dollar for a 1 Liter water refill, which is a lot. The owner Anna is really helpful though.